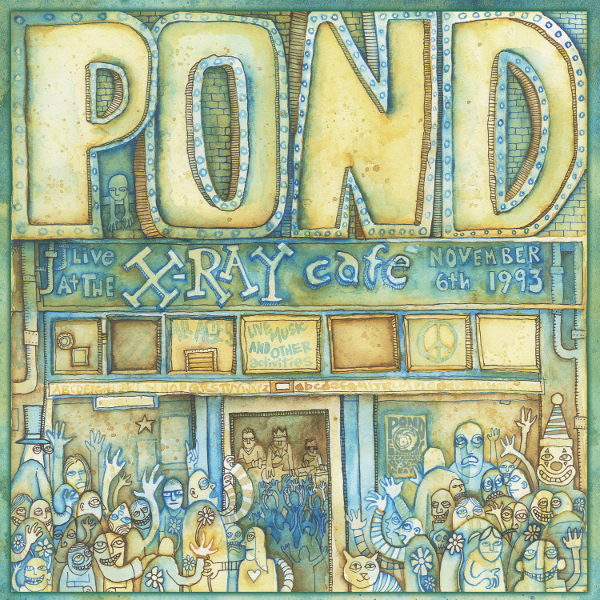 Pond was not named for a specific body of water. Rather it was “pond” as a concept. And beneath seemingly calm waters were the marvelous kingdoms of elusive creatures, thriving in vibrant ecosystems of sound and turbulence. And here is Pond doing what they did best: Shaping huge sound mounds into something strangely approaching pop music—from the wrong direction. This recording will be Volume 7 of “Tales From the Grease Trap” the series of live recordings from Voodoo Doughnut Recordings documenting early 1990's shows at Portland venues Satyricon and the X-Ray Cafe. So it was a big deal when Pond got signed to SubPop Records in 1993. “The X-Ray was also the place where SubPop offered us a recording contract after one of our shows there,” remembers bassist and singer Chris Brady. Obviously the label honchos spotted something thrilling in Pond’s music, which was best absorbed in a live setting, with Chris Brady strumming his Rickenbacker bass high up on the neck while keening into the microphone, Dave Triebwasser on drums. Guitarist and singer Charlie Campbell was equally at home unleashing Pandora’s stomp-box of sounds or gamely plucking a bright little melody inside the eye of the twister.